Featuring an outdoor pool and a garden, Grand Rixsoss Palace is located a 15-minute drive from Batumi city centre. Free WiFi and free private parking are provide on site. The rooms offer air conditioning, a balcony, seating area and satellite TV. The bathrooms provide a hairdryer, slippers and free toiletries. Hotel's restaurant serves Georgian and European cuisine, and guests can also use property's barbecue facilities. There is also a bar on site. Room service and breakfasts in the room are provided upon request. Billiards and table tennis can be enjoyed in the hotel. The water park and the dolphinarium are a 20-minute drive away. Batumi Train Station is 8.4 km away, and Batumi International Airport is 2.9 km from Grand Rixsoss Palace. Set 50 yards from Ardagani Lake, Sky Tower Hotel features modern accommodation in Batumi. This property offers spa centre and indoor pool. Private parking is available for free. Offering the views of sea and lake, all rooms are elegantly decorated. Featuring air conditioning and a flat-screen TV with satellite channels, each room includes a working desk and minibar for your comfort. 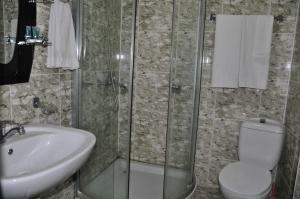 Complimentary bathrobes, slippers, toiletries as well as a hairdryer can be found in the bathroom. Free WiFi is available throughout the property. 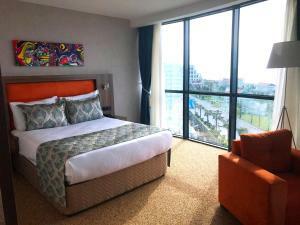 Sky Tower Hotel guests can benefit from sauna, massage facilities and fitness centre. Guests can enjoy in the on-site bar by sipping their drinks. You will find a 24-hour front desk at the property. Dolphinarium is 0.8 miles from Sky Tower Hotel, while Batumi Archeological Museum is 1.2 miles away. 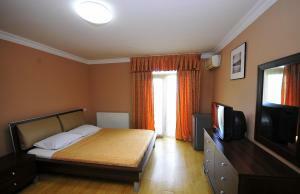 The nearest airport is Batumi International Airport, 2.5 miles from the property. 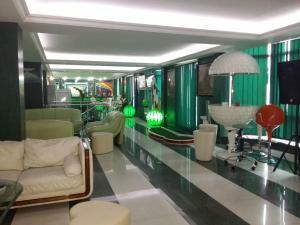 This hotel is located in the heart of Batumi, a 3-minute walk from the pebble Black Sea coast. A casino, free Wi-Fi and a 24-hour reception are featured at Anadolu Hotel. The bright, air-conditioned rooms offer warm-coloured interiors and classic-style décor. Every room comes with a flat-screen TV, a minibar, a balcony and a private bathroom. 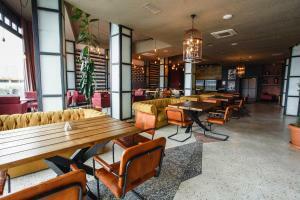 The on-site restaurant serves Caucasian cuisine, and a variety of drinks is offered at the bar. A variety of cafés can be found within a 5-minute walk from the hotel. The Medea Statue and the Fountain Square are a 10-minute walk away. A bus stop, providing access to all the city's districts, is a 3-minute walk from Anadolu Hotel. Batumi International Airport is 7 km away. 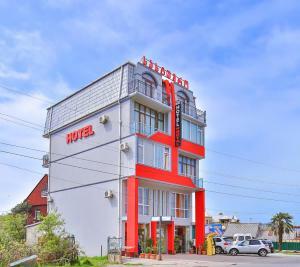 This hotel is located in Batumi, a 5-minute walk from the Black Sea beach and 2.5 miles from the city centre. Free WiFi, free parking, and a 24-hour reception are featured at Hotel Royal. The bright, air-conditioned rooms offer warm-coloured interiors and classic-style décor. Each room includes a TV, bathroom, fridge and balcony. The on-site restaurant serves Georgian and Turkish cuisine, and a variety of drinks is offered at the bar. Attractions in the area include the Dolphinarium and the Zoo both located 2.7 miles away. Makhinjauri Train Station is 6.2 miles from Hotel Royal, while Batumi International Airport is 1.4 miles away. 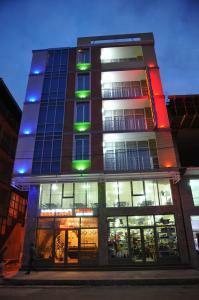 Moni Hotel is located in the centre of old Batumi, 150 meters from Piazza Square and 100 metres from the Batumi Harbor. It features air conditioning, and free Wi-Fi is available throughout. Featuring modern-style interiors with light-coloured tones, the rooms come with a flat-screen TV, wardrobe and minibar. The private bathrooms include slippers and free toiletries. Various cafes and restaurants are located a 5-minute walk from Moni Hotel. A grocery shop is 400 meters away. The beach is located 500 meters from the hotel, and the Batumi Lighthouse is 300 meters away. The distance to Batumi International Airport is 7 km from the property. Featuring luxurious interiors, Wyndham Batumi is a few minutes' walk from Iveria Beach. Offering a swimming pool and spa, this property has a sea view as well as an on-site casino. Free WiFi and private parking are available. Classically decorated with glittering furnishings, sound-proofed rooms come with hardwood floors and city view. Along with air conditioning, rooms are fitted with a flat-screen TV with satellite channels and minibar. There is an electric kettle with tea and coffee setup in each room. Rooms feature private bathroom with complimentary toiletries, bathrobe and slippers. Certain units include a seating area. Guests can enjoy a drink at the bar. There is an à la carte restaurant where special diet menus are available on request. Wyndham Batumi offers spa and wellness centre including a sauna, hammam, hot tub as well as swimming pool. An equipped fitness centre is available on-site. For your convenience there is a currency exchange, atm and valet parking. Europe Square is 100 yards from Wyndham Batumi, while Piazza is 450 yards away. Batumi International Airport is 3.1 miles from the property. 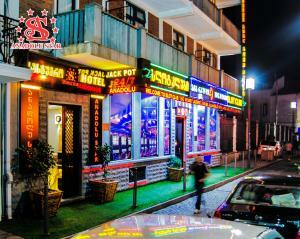 Hotel Chveni Sakhli is located in Batumi, just a 5-minute walk from the Black Sea coast. Free WiFi access is available. The property offers free parking. Each room here will provide you with a TV, air conditioning and a minibar. There is also a dining table. 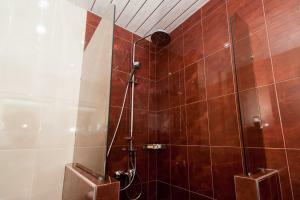 Featuring a shower, private bathroom also comes with a hairdryer, bathrobes and slippers. Extras include satellite channels and cable channels. At Hotel Chveni Sakhli you will find a 24-hour front desk. Guests can enjoy free coffee and tea at the 24-hour lobby bar. A variety of cafés and restaurants can be found within a 5-minute walk of the hostel. Other facilities offered at the property include a shared lounge, luggage storage and an ironing service. Makhinjauri Train Station and Batumi International Airport are 6.5 km away. 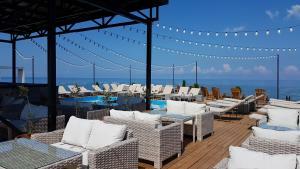 Located 15 minutes' walk from the Black Sea beach and the Dolphinarium, this hotel in Batumi features free Wi-Fi and air-conditioned rooms with a flat-screen TV. The private parking is free. Each room at Prestige Hotel is decorated in a modern style and has a seating area, as well as a balcony overlooking the city and the Caucasian Mountains. The Prestige's restaurant serves Georgian and Turkish cuisine, and local wines are offered at the on-site bar. Batumi Train and Bus Stations are 4 minutes' drive from Prestige Hotel, and a shuttle service is available. Batumi Airport is 10 minutes' drive away. 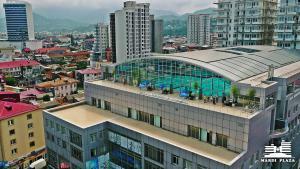 Offering a sauna and hammam, Hotel Alik is situated in Batumi, 200 yards from Europe Square. Guests can enjoy the on-site bar. Free WiFi is offered throughout the property and free private parking is available on site. Each room is equipped with a flat-screen TV with satellite channels. Some rooms feature a seating area where you can relax. Certain rooms have views of the garden or city. 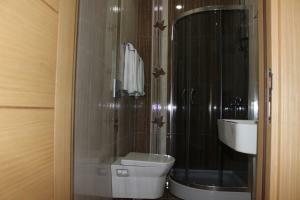 Every room is fitted with a private bathroom equipped with a bath. For your comfort, you will find bath robes and slippers. You will find a 24-hour front desk at the property. You can also play billiards at the hotel. Piazza is 350 yards from Hotel Alik, while Alphabet Tower is 550 yards from the property. Batumi International Airport is 3.7 miles away. Located 10 minutes' walk from the Black Sea beach, this hotel in Batumi features a roof top terrace and rooms with air conditioning. Batumi Train Station is 5 minutes' drive away. 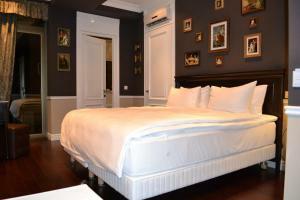 Each room at Old City Hotel comes with modern décor and a flat-screen TV. A shower is provided in the bathrooms. The Old City's restaurant serves Georgian cuisine and European specialities. Local wines are offered at the on-site bar. Guests of Old City can relax on the roof top sun terrace with sun loungers, or explore Batumi's sights within a short walk of the hotel. Medea Statue is 500 metres away. Batumi's Dolphinarium is 3 minutes' drive from Old City Hotel, and it is 10 minutes' drive from Batumi Airport. 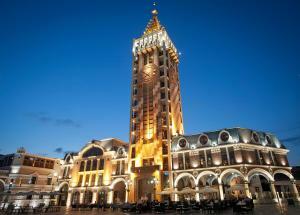 Featuring free Wi-Fi and unique décor, this hotel is in the clocktower in the historic center of Batumi. It features air-conditioned rooms with a flat-screen TV. It is only a 330-yard walk from the coast. Each room at Piazza Hotel includes an individual interior and a balcony. The bathrooms are stocked with bathrobes and slippers. The property features the Mimino Georgian Restaurant, European restaurant Marco Polo, La Brioche Café and the Quiet Woman Irish Pub. In the center of the city, Piazza Hotel provides good access to such Batumi's attractions, as Medea Statue, a 6-minute walk away. The 6 May Park with the Dolphinarium are a 15-minute walk from the hotel. 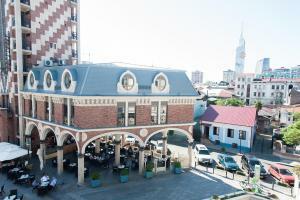 Batumi Train Station is a 10-minute drive from Piazza Hotel, and it is a 10-minute drive from Batumi Airport. Kutaisi Airport is 75 miles away. Transportation to both airports is available upon request. 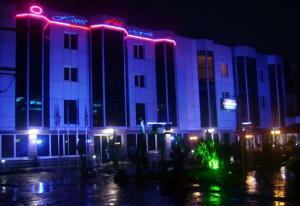 This hotel is located in the centre of Batumi, 300 metres from the Black Sea coast. Free Wi-Fi and a 24-hour front desk are featured at Lux Hotel. The bright, air-conditioned rooms come complete with a TV, a refrigerator, a balcony and a private bathroom. A restaurant serving Georgian cuisine is on site. A variety of cafes and bars can be found within a 5-minute walk from the hotel. Rustaveli Avenue is a 5-minute walk away. The Medea Statue is a 10-minute walk from the hotel. Batumi Central Train Station is 2 km from Lux Hotel. Batumi Airport is 6.5 km away. 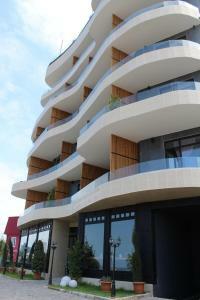 Piazza Four Colours is located in the centre of Batumi, 200 metres from the Black Sea coast. Free WiFi access is available. Each room here will provide you with a TV, air conditioning and cable channels. Featuring a hairdryer, private bathroom also comes with free toiletries. Extras include a desk and a safety deposit box. At Piazza Four Colours you will find a 24-hour front desk, a bar and a mini-market. The on-site restaurant serves European and Georgian cuisine. 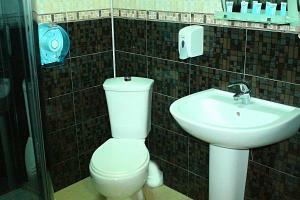 Other facilities offered at the property include meeting facilities, luggage storage and shops. Batumi Airport is 6 km away, and Kutaisi Airport is 120 km from Piazza Four Colours. A shuttle service to both airports is provided upon request. 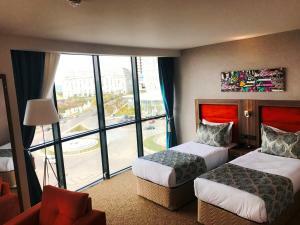 56 Lech and Maria Kaczynski St.
Overlooking to sea and the city, Best Western Plus Batumi is located on the beachfront, 1.3 miles from Aquapark Beach. The property offers a seasonal outdoor pool. Guests can enjoy a drink at the on-site bar. Public parking on site and free WiFi is available throughout the property. 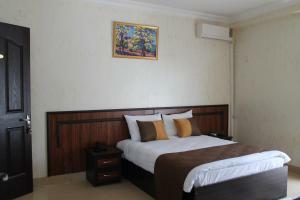 Modernly decorated rooms come with air conditioning, flat-screen TV with satellite channels. Certain rooms have a sofa bed as well as a balcony with city view. You will find a working desk, safety box, kettle and fridge in the room. 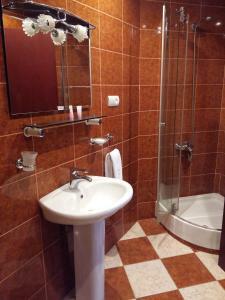 Private bathrooms are fitted with a bath or shower. For your comfort, you will find bathrobes, slippers and free toiletries. Guests can enjoy a meal at the restaurant. Airport shuttle can be arranged for free. Dolphinarium is 4.3 miles from Best Western Plus Batumi, while Batumi Archeological Museum is 3.5 miles away. Batumi International Airport is 2.1 miles from the property. Located in the city centre of Batumi, a 2-minute walk from Batumi Bay, Plaza Hotel features an indoor swimming pool, a spa and wellness centre, a sauna, massage services, and free Wi-Fi access throughout the property. The modern and air-conditioned rooms here are equipped with a flat-screen TV with cable channels, a balcony, and a private bathroom with a bath or shower. Other hotel facilities include a fitness centre, a bicycle rental, a 24-hour front desk, an on-site mini-market, a bar, and a beauty shop. Tbilisi Square is a 2-minute walk away, Batumi Art Museum is a 12-minute walk, and the Statue of Medea is a 10-minute walk from the hotel. 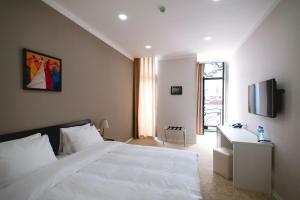 Plaza Hotel is a 10-minute walk from Batumi bus station, 3.5 km from Batumi Train Station, and 6.5 km from Batumi Airport.